A freelance writer living in Perth, and always on the search for something new, different and exciting. I first set eyes on these wacky musicians at a music festival in 1999, when the majority of their songs were about things like sweaters and Playstations. 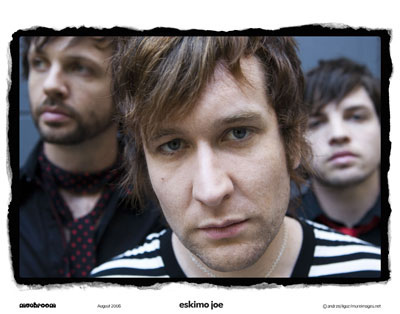 That's why today, it blows my mind to see how far Eskimo Joe have taken their unique sound, talent and experience. Recently releasing their 5th and most inspired album to date, 'Ghosts of the Past' adds another well-deserved notch in the Joe's belt. You may have already heard the first single from this album 'Love Is a Drug' already on play-list at radio stations across Australia. Now, you have the chance to see it performed live, along with other sure-to-be-hits from the new album. September 14 - Andergrove Tavern, Mackay QLD. Tickets. September 15 - Magnums, Airlie Beach QLD. Tickets. September 16 - Great Western Hotel, Rockhampton QLD. Tickets. September 17 - Sugarland Tavern, Bundaberg QLD. Tickets. September 21 - Wollongong Uni, Wollongong NSW. Tickets. September 22 - The Cube, Cambelltown NSW. Tickets. September 23 - Bar on the Cube, Newcastle NSW. Tickets. September 24 - Enmore Theatre, Newtown NSW. Tickets. September 29 - The Forum, Melbourne VIC. Tickets. September 30 - Pier Live, Frankston VIC. Tickets. October 1 - Deni Muster & Play on the Plains Festival, Deniliquin NSW. Tickets. October 5 - Plantation Hotel, Coffs Harbour NSW. Tickets. October 6 - Southern Cross Uni, Lismore NSW. Tickets. October 7 - Caloundra Music Festival, Kings Beach Park, Caloundra QLD. Tickets. October 8 - Full Noise Festival, Townsville & District Rugby Union, Currajong QLD. Tickets. October 9 - TivoLi, Fortitude Valley QLD. Tickets. October 14 - The Astor Theatre, Mount Lawley WA. Tickets. November 25 - Queenscliff Music Festival, Queenscliff VIC. Tickets. December 3 - Homebake, The Domain, Sydney NSW. Tickets. 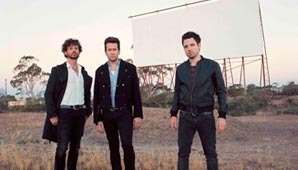 From their humble beginnings as a small indie-rock band in Fremantle WA, to their massive nation-wide following, once you see Eskimo Joe live you'll be talking about the experience for years to come. Got to love some good old Aussie Rock. I have loved these guys since they first hit the radio and can not wait to see them live. Great review and thank you for bringing everyones attention to a truly talented band of human beings.